I ran today. Without pain. I don’t remember the last time I ran without pain. It was a lot easier to run, let me tell you that. I didn’t even realize I had no pain until I was finished and was like hhmm, that was fast and felt good. Then I got to thinking, did I have pain yesterday? I don’t think I did. I had ran with pain for so long that I had gotten used to it. It was just an every day part of my life. A pain and irritating but it didn’t stop me from running. Well, it did stop me from running like I used to but I could still run. Which brings me to my topic for today. Running with sin. How many of us are so used to sinning that we don’t even think about it anymore. It has just become a part of our lives. Lying, cheating, addiction, idol worship, spending more than we make, etc… We don’t even think it is wrong anymore, it’s just become a part of who we are. We limp around everyday with the sin on our back. It doesn’t stop us from living. Not only sin but let’s talk about shame, guilt, fear, pride, etc.. The monkey is on our back but we just keep on going. Sometimes we add on to it until the weight becomes so much we can longer carry it. Then we break. The smart thing for me to do when I am injured is to slow down. Take a few days off. Rest my injury so I can get back to a pain free run. However, I usually don’t heed that advice and keep going until it heals, which takes longer, or it hurts more, or I just get to the point I ignore it. When I run with sin what should I do? Stop doing it. Pray to God to help me. I know it’s wrong but some things will take more than me knowing it for me to stop. I need to break the addiction. I need someone to hold me accountable. Maybe it’s a best friend or my pastor or someone I will trust to be honest with me. Confess my sins and know that I am forgiven. Fight another day. Let the guilt, shame, pride, fear go. Give it all up. I don’t want to run with sin. I want to run with God and there is only one way I know how to do that. Give it all to Him. Work on it every single day. Before I know it, I will wake up one day and truly be free. I will be able to live my life without all the junk and pain I added to it. How about you? 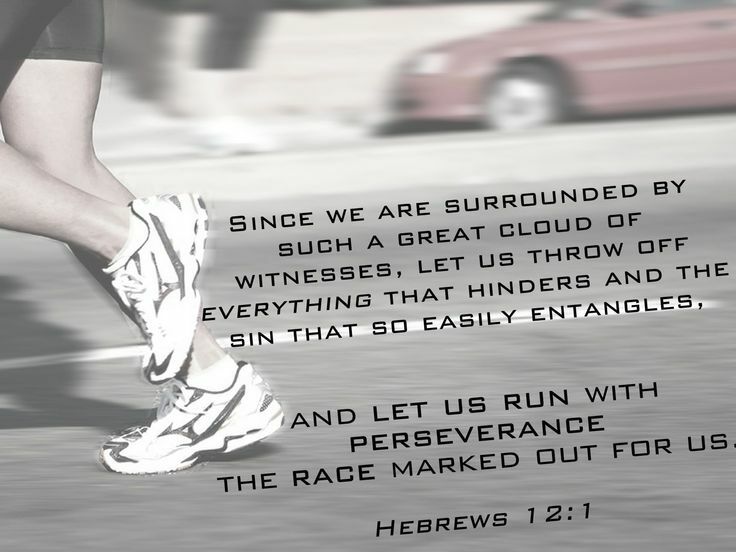 Are you tired of running with sin? Want to be able to live free? This leads to a lot of thinking…deep stuff here! Excellent post!